Grenada Wins the OECS Swim Title for 3rd Straight Year! Grenada’s OECS Champion Swim Team returned home on Monday following 3 days of intense competition in St Lucia where they retained their title for a 3rd consecutive year. It was keen competition and rivalry as St Lucia, St Vincent, Antigua and Grenada swimmers all vied for the OECS title. The 3-day event kicked off on Friday and Grenada’s team was ready for what was certain to be an intensely contested competition. Coming into the competition as the champion for the past 2 years all competing teams had the goal of dethroning Grenada. At the end of the 1st day Grenada trailed behind St Lucia with by 2.5 points after suffering an unprecedented 2 questionable disqualifications very early in the competition, which cost the 16 points on the 1st day of the competition. By the end of Day 2 Grenada regained a marginal lead over St Lucia with only 8 points separating the 2 teams despite some infractions leveled against swimmers who finished in the top 3 positions in most instances. Despite this challenge the team remained in high spirits and focused in the face of adversity. They were mentally fit for the challenge as pursued their game plan to the end. By Day 3 team Grenada knew there was little room for slippage and they had to perform at their best. All swimmers pull out all their strength and put on a sterling performance for the final day. The end result was retaining the OECS Championship title with 25 Gold medals, 44 silver medals and 44 bronze medals. In addition to the total accumulation of 113 medals, all our swimmers put out personal best times in their respective races. The team met its goal of retaining the OECS Title for the 3rd consecutive year. Additionally, a number of swimmers were in the top 3 performers of their overall age group category. Zackary Gresham won the overall title in the boys 11-12 age group, Kimberly Ince won the overall title in the girls 11-12 age group our overseas based swimmer Oreoluwa Cherebin won the overall title in the girls 18 and over category. GASA is especially proud our 15-17 boys swimmer Dajenel Williams, who emerged the Gold medalist in the 50 Meter Butterfly. Williams emerged as an identified talent from the Ministry of Sports School Swimming programme. He was adopted by one of the clubs and has always demonstrated a natural talent in the pool. GASA President, Peron Johnson said, “we are especially proud to witness Dajenel elevate to a Gold medal winner on the Regional stage.” His commitment and dedication to his training has earned him this regional honour. Dajenel is a true demonstration of what providing a nurturing environment that supports the development of talent will allow. The national coaching squad was a combined effort led by National Coach Gerson Escobar and supported by Mandy Dean and Chris Regis. Through the support of the Grenada Olympic Committee the team was also supported by a US based coach and stroke specialist who worked with the team in the last 2 weeks of their training on to fine tune their technique. GASA thanks the GOC for the provision of technical assistance to the National Swim Team and continued support for the development of swimming in Grenada. Over the past few months the swimmers also engaged in a strength-training programme with personal fitness trainer, Suzanne Latouche. This programme contributed significantly to the improved performances of our swimmers over the past few weeks. It was the goal of GASA to put out a team that was not focused on just individual performances but the overall team and we are happy to see that it has paid off. 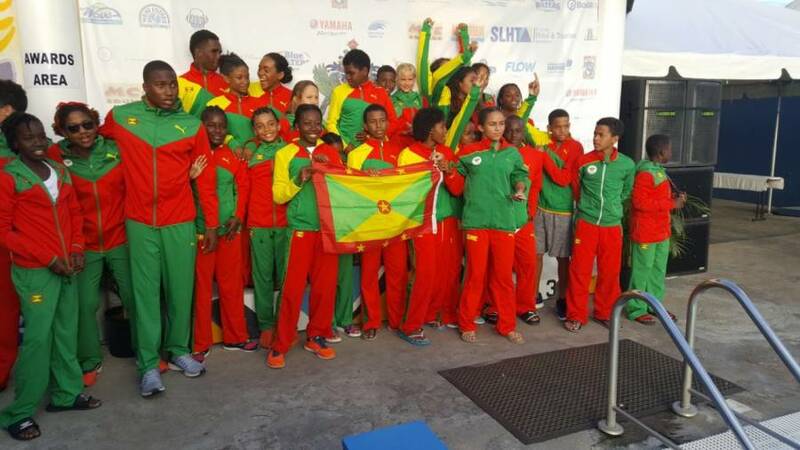 While Grenada continues to demonstrate their strength in the sport of swimming locally regionally and internationally, this all continues to be accomplished in the most adverse conditions. Facing competing islands who have far superior training facilities, it begs to wonder how much further along our progression would be if we possessed the proper facilities for further the development of our swimming athletes on island. Top on the agenda will be further engagement of government for the construction of an aquatic center to advance the development of the sport.